"Why should we hire you?" is one of the top 5 interview questions you will be asked. We show you how to provide the type of interview answer employers are looking for. 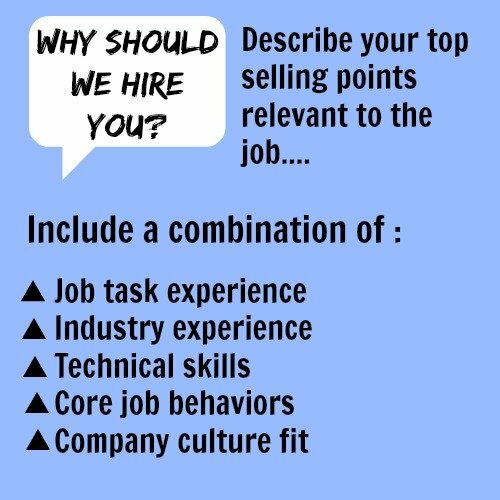 To provide a concise and convincing summary of the top reasons why the company should choose you, you need a good understanding of the most important requirements for the job. Carefully going through the job posting, understanding the job description and researching the company will ensure you know the skills and experience you should focus on in your interview answer. 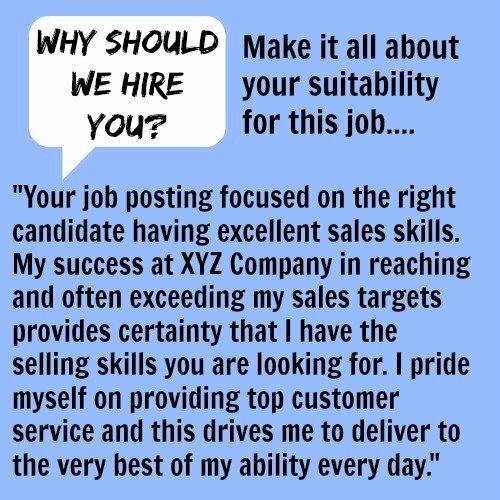 The key to answering this interview question properly is to highlight what makes you an excellent candidate for this specific job opportunity. Focus on your accomplishments and how they ensure your success in this job opportunity. In which areas of the job description do you really shine? What if the new job opportunity requires a change in career or industry for you? 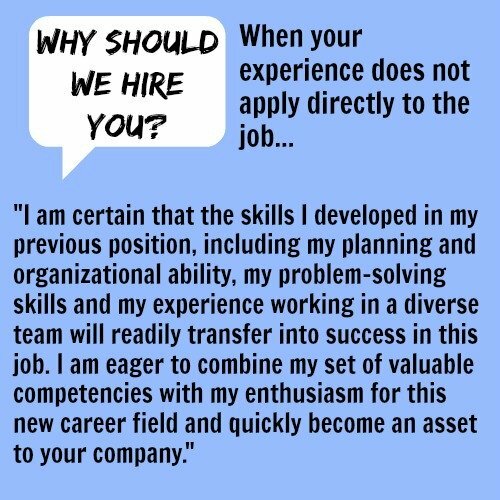 This example interview answer to "Why should we hire you?" shows you how to make your experience and background work well with the new role. This interview answer is for job candidates with little or no work experience. It is always tricky knowing what to focus on when you have minimal working experience to draw on. This excellent sample answer can be easily adapted for your own use. You need to be ready for this interview question - it is one of the most frequently asked questions and is a great opportunity to stand out from the crowd. 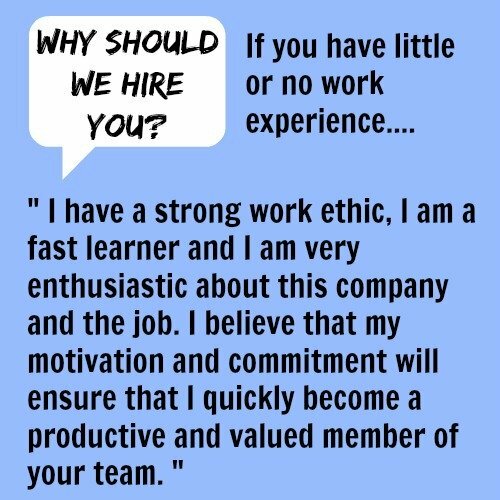 For more good sample interview answers to "Why should we hire you?". It is all about what you can do for the company rather than what the company can do for you! - the employer wants to know what value you will add to the company, not why you think the company will provide you with what you want. Prepare beforehand and be ready with your top 3 to 5 selling points as they relate directly to this specific job. 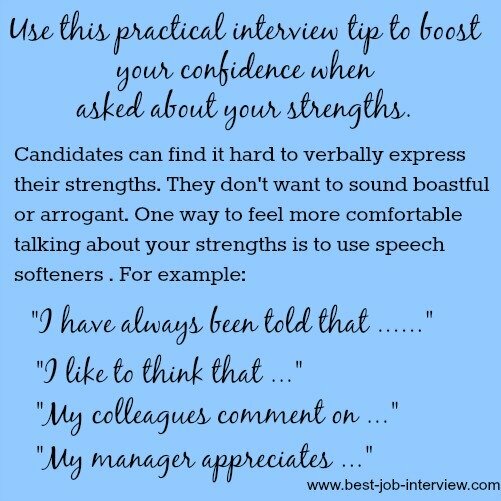 Be confident that you are the right person for this job and be willing to tell the interviewer what makes you a great fit. If you find it difficult to promote your own strengths use the examples below to help you feel more comfortable. Avoid talking too much and merely repeating what is on your resume, keep it concise and relevant. Our sample behavioral interview answers show you how to answer the most common behavioral interview questions with ease. How to develop a winning interview answer to "Why Should We Hire You?" 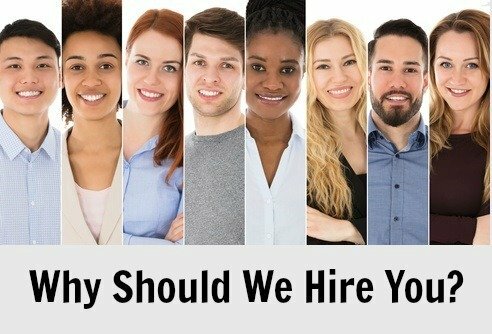 Job Interviews > Common Interview Questions > Why should we hire you?